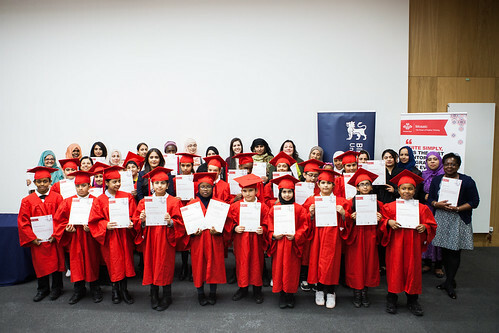 Pupils from a series of primary schools in the West Midlands have graduated from Mosaic’s Primary School Programme at two special ceremonies held at Birmingham City University. Pupils from Arden Primary, Parkfield Community Primary, Ward End Primary, St Georges Church of England Academy, Ladypool Primary, Uplands Manor Primary and Nelson Mandela Primary School were joined by their dedicated mentors as well as teachers and families for the events. The keynote speaker for the first graduation was HMRC debt collector Romaana Patel while lawyer, writer and public speaker Abda Khan spoke at the second. Mosaic extends its thanks to the pupils’ mentors from Birmingham City University, West Midlands Police, Newman University, University of Birmingham, BPP University, DWP, University College Birmingham, KPMG, Mazars, Ormiston Forge Academy, PT, Gowling, Birmingham Irish Association, Birmingham City Council and Midland Heart. The Primary School mentoring programme is made possible in London thanks to the generous support of Human Appeal and TRS Foundation.